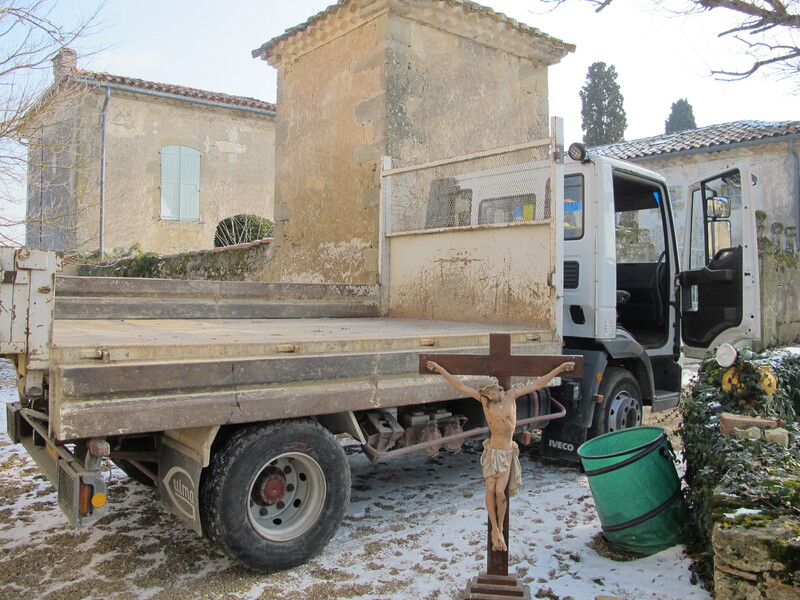 A member of La Police Rurale turned up this week and asked us to move the cars from in front of the church, so a truck could back up to its door. He was accompanied by three municipal workers eager to start filling the truck with stuff from the church. and stacking the pews ready for transporting. The dismounted statues began to resemble the cast of a episode of a religious costume drama– casually chatting while waiting to be called on set! 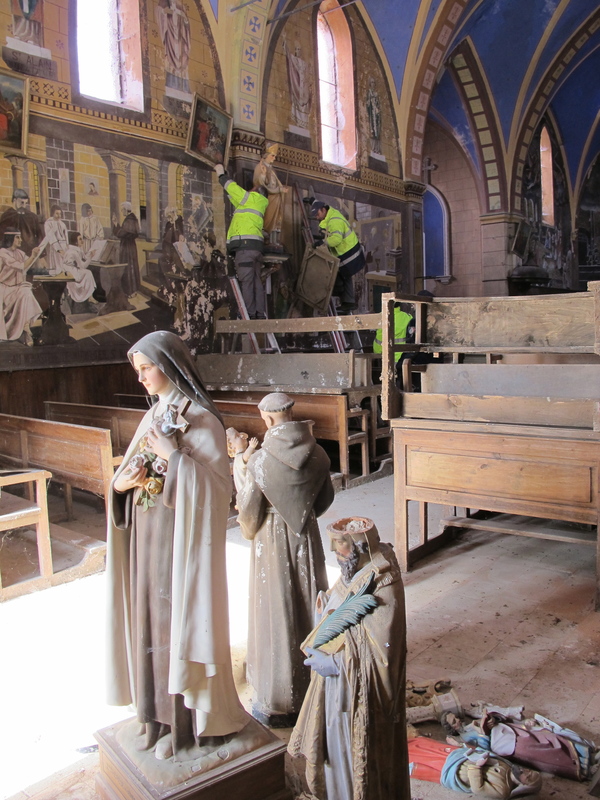 Two weeks ago the same policeman told our friend Deming–who was cat sitting for us while were in Strasbourg and speaks fluent French–that the church’s demolition was imminent! Poor Deming, assuming we knew this was going to happen, e-mailed us the news. It was a bolt from the blue–we had no inkling that there was such a plan or that it’s execution was imminent! The idea that this large presence–so much part of our lives and the landscape–would vanish, was a real shock. Pulling the church down would be a hugely disrupting procedure. It would be expensive for the Mairie (churches in France are the property of the State)–and politically delicate. To spend so much money on pulling down an old church, money that might otherwise be invested in more deserving causes, would be controversial to say the least. It would also greatly upset not a few of the Mayor’s voting constituents many of whom still had family links with the parish. NIMBY* thoughts started creeping into our paranoid minds. What would be put in its place? Would they sell the land for construction? Surely not. We were in Strasbourg, it was the weekend, the Mairie would not be contactable until Monday—aaaaah! We live in an 18th century présbytère–the priest’s house, the vicarage–though it’s 90 years since a priest was living here–but our neighbours remember walking across the fields barefoot as youngsters to learn their catechism in what is now our kitchen. 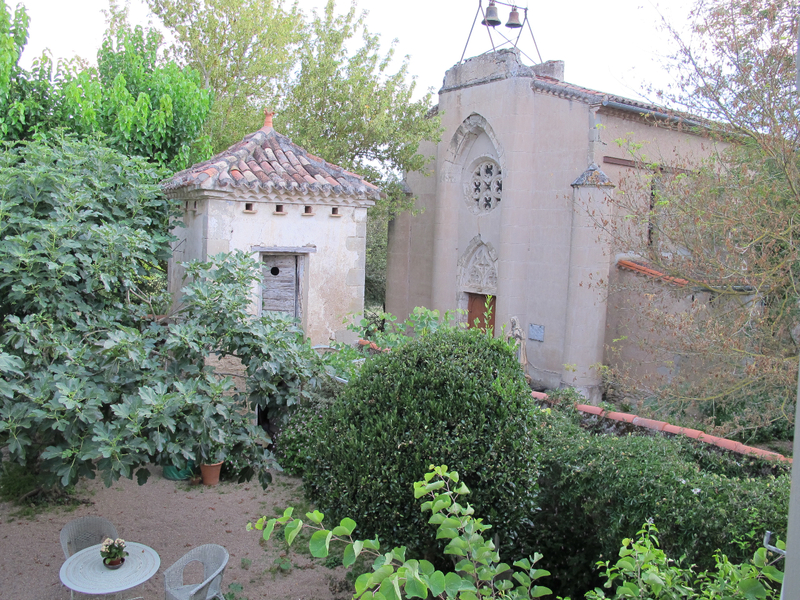 The church stands just to southwest side of the courtyard and outside it, behind the pigeonnier. It was built in the 1860s. The original place of worship was partially destroyed at the time of the revolution. It is attached to the main house and is now our utility room, a storage space and a mess! When we bought the house in 1990, the “new” church was still being used twice a year for services–on Easter Monday and at Toussaint (All Saints Day, November 1st). 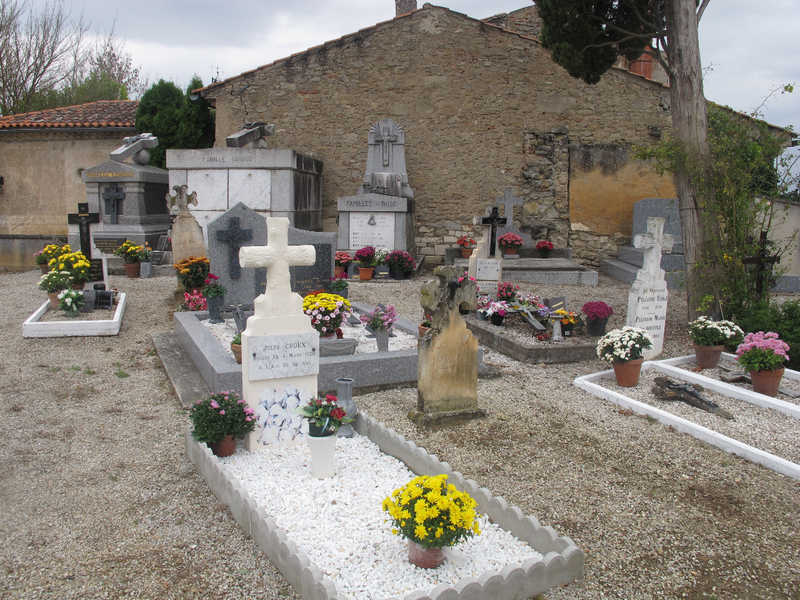 Occasionally there would be a funeral involving one of the local families, whose tombs stand in the little cemetery. 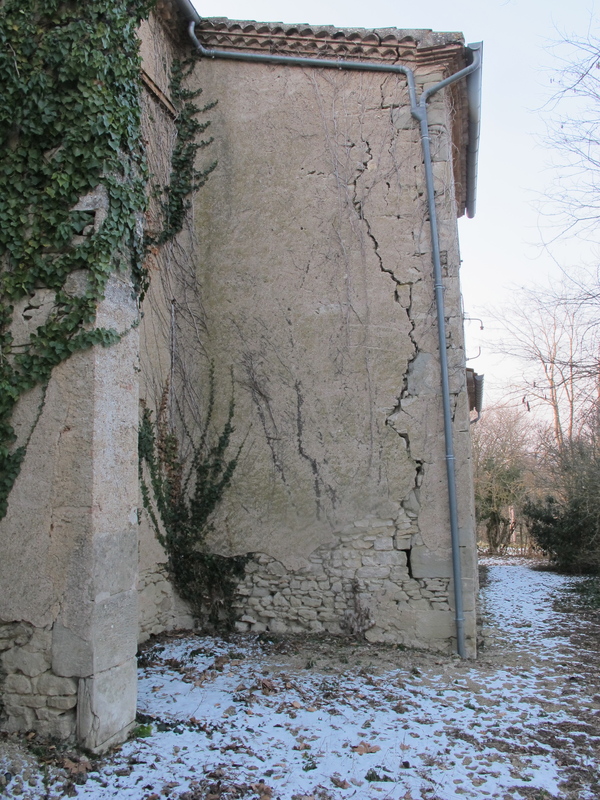 But some years ago a crack appeared in one of the side chapels and the Mairie in Lautrec pronounced the building unsafe. It was locked and no service has been held inside since. Interested locals–including us–formed an association to try to find a way of at least securing the safety of the building and thus preserving it. (I was the unlikely choice for Vice President–a heartbeat away from the Presidency!). …but the church has stood defiant–against the odds. We had persuaded ourselves that that was the way it would stay. Until the email from Deming appeared in the in-box! On our return, we immediately rang all our neighbors, desperate–well keen–to find someone who might be able to shed some light on the mystery. No one had heard a word about it! Our friend Myriam promised to ask her sister-in-law, a member of the ruling group on the council, if it was true that they were planning to demolish the church. The next day a beaming Myriam had the answer. 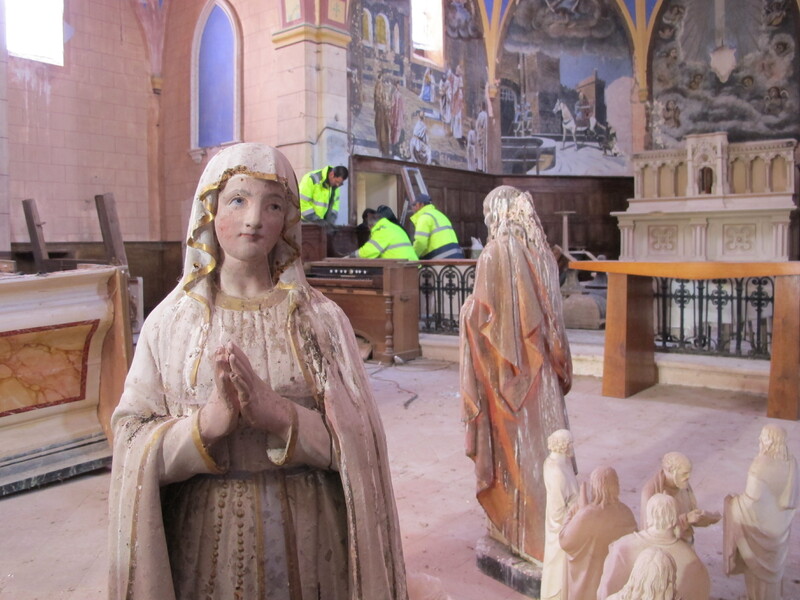 NO, emphatically, NO–of course they were not going to demolish the church. They were simply planning, very sensibly and not before time, one might say, to remove everything of value from the building. That was what was IMMINENT and what was happening that morning. I’m willing to lay a bet on who got the wrong end of the Bishop’s crook! It looks like a beautiful church and that interior is really something. I was racing through your blog entry to see what happened. So glad to hear it is NOT being demolished. ps. who did the beautiful murals, and are they going to be preserved? For the moment–as long as the building holds. on February 11, 2012 at 8:59 pm | Reply Caroline P.
I think they saw you departing for Strasbourg and they thought “this is our chance ..now or never” but…I’m so glad it wasn’t true. What a beautiful church with so much character. Thank for sharing. Good story with a great ending! Let’s hope it stays that way! It would be WRONG on many levels to destroy this grand building! Keep us updated! It’s too beautiful a building and too important in the history of the town to be torn down. And what use would be made of the space that would in any way compensate for the loss? I hope that it stands much longer or that effectual repairs can be made. Has an engineer looked at the building to determine what would have to be done to secure it? 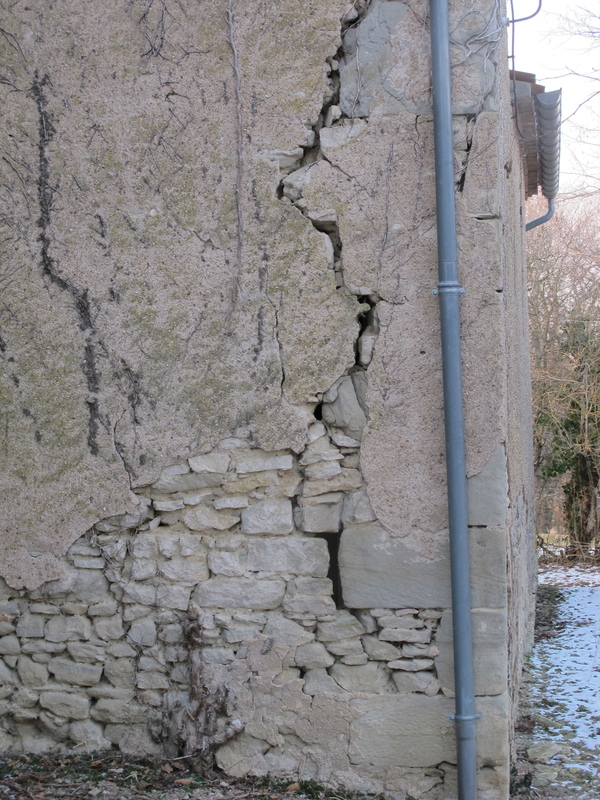 We were told that they did bring in structural engineers and it was decided that the cost of repair didn’t warrant the expense (somewhere around 60,000 euros–probably more now….). It is true that the congregation has dwindled to a handful (this is the case for many rural churches around us) but we too feel it would be better to preserve the building which has charm and value. In recent years Lautrec built a much-used swimming complex with other outdoor activity areas. They also built a new school. It’s easy to appreciate that these projects are more attractive uses for scarce funds than restoring an old church. (That said, some other small churches around here have indeed been restored–so they are making their choices….). We live in difficult times. Just hope the little church doesn’t fall down…. All’s well that ends well! Glad it will not be demolished. What a beautiful church, do you think they were hoping you were still away and could get it done before you came back.The lovely paintings on the walls look so vivid and colourfull,it would be a great same to loose something so special,and it looks to be quite a large building. -hope all will be well. Yor blog to day has made me feel sad. This beautiful building has provided solace in strife,joy in celebration and support for the village but now has to bow to time and crumble. Also it has the indignity of being stripped by removing it’s relics which have been an integral part of it. I wish you and your committee all the best in saving it. catechism,don’t know about you but I and about 15/20 others learnt ours verbatim in the brownie/guide and scout hut,from the verger,who I still recall was not at all use to the company of children( we of course were little angels!!!!) The crack in the wall looks bad is there no way of getting it repaired? at a reasonable cost if there is such a thing by the church authorities or the govenment. Can not believe they did not take up an appeal years ago for repairs of the church. Would be a great loss if it was pulled down. Still I would not trust what the officials are saying would only take an administrator or a bean counter to suggest pulling it down and selling the land off. I have little faith in government department no matter what country. 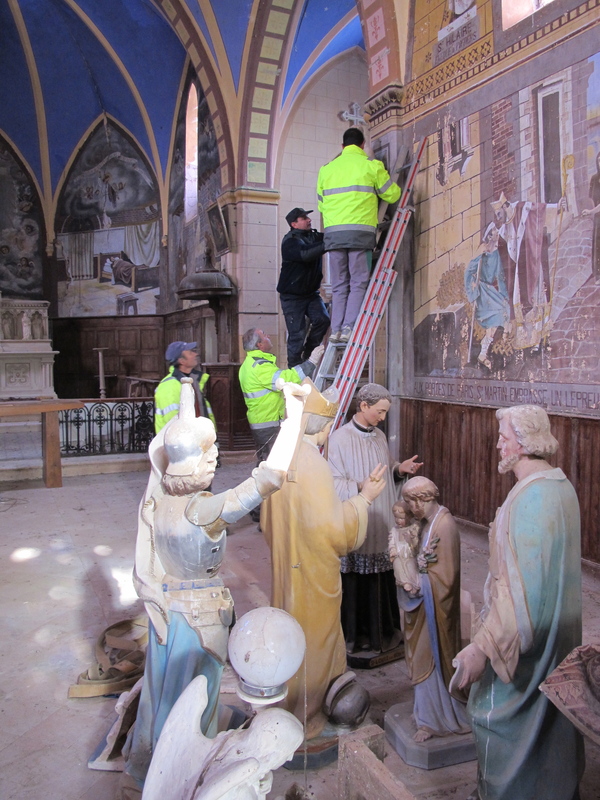 Dear Robin,I hope that they don’t demolition, beautiful murals by the way.There so many old buildings churches etc.. for sale in France, this one not? Strange indeed.It wories me also for that little cementary.I cross my fingers that they don’t demolition and the crack will be fixed for everone’s safety.Hope everthing go’s well and the statues getting back in it’s place.Hughs, Chantal. Thanks for sharing! I fully understand the terror you felt over losing it! It looks awesome. My dad bought a chapel in the north of Sweden many years ago to save it, and every summer people from the village gather to sing and have fellowship there. Really hope they rather restore that church or that someone can buy it to save it..
Dear Camilla, what a beautiful story! I am Swedish myself and treasure the history of the place. Thanks to your dad! I am so sorry to hear about the potential destruction of your beloved church. There aren’t laws to protect such historical structures there? We have similar problems in Washington, D.C. Even though we have laws in place, we have to fight for every historic preservation law to be upheld. There is always someone with the almighty dollar beckoning the politicians to make the bad decision. I hope there is something you can do! I am so happy for you both that the church will remain standing. It is such a very special place. on February 12, 2012 at 6:30 pm | Reply Dianne P.
So sad to hear about possibly losing this beautiful church! As others have said, the murals alone look gorgeous enough to put a stop to its destruction. Where are all the statues & pews going? 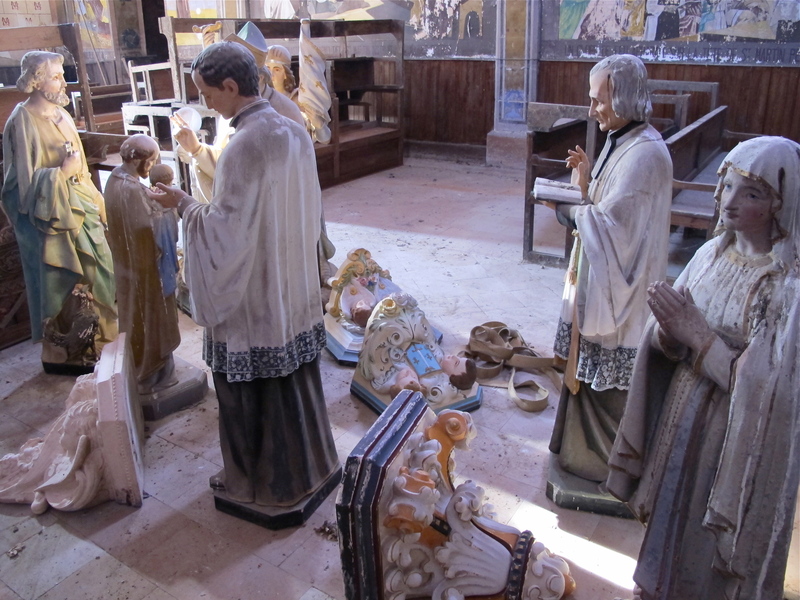 When my husband’s little hometown parish was decommissioned–a larger church had been built a few miles away, and all the older parishioners had died off–they sold some of the items, saved a few statues for its sister church, then sent other items to churches in poor countries. But here’s the warning: when the building’s destruction was still “weeks or months away,” the local historical society tried to get a court order to stop the destruction, and that prompted the property owner to move even faster! We drove by one Sunday afternoon, snuck in the side door to see what was happening inside–no one had saved the stained glass windows; there were broken pieces everywhere (we saved a bit)–and the next day, the whole building was GONE! But it was the diocese that couldn’t afford to keep both buildings going…and no one else was fast enough to try to save it. on February 13, 2012 at 7:05 pm | Reply Melanie O.
I sincerely hope that there has just been a misunderstanding and that the church will remain standing for generations to come. That connection with history is so important. One of the things I loved about my visit to France was the way that old things are still valued. A walk through a village was like a walk through time. Every demolition diminishes this charm, and I have to hope that with enough people speaking up, the church will stay. Destroying this chuch would be a travesty! I wish you the best of luck. In my experience unless a court of law says it will not be touched, you are still unprotected. Any chance you can get it designated a “historic site” for preservation? That would be difficult, Maureen. “You must do the thing you think you cannot do.” – Eleanor Roosevelt. 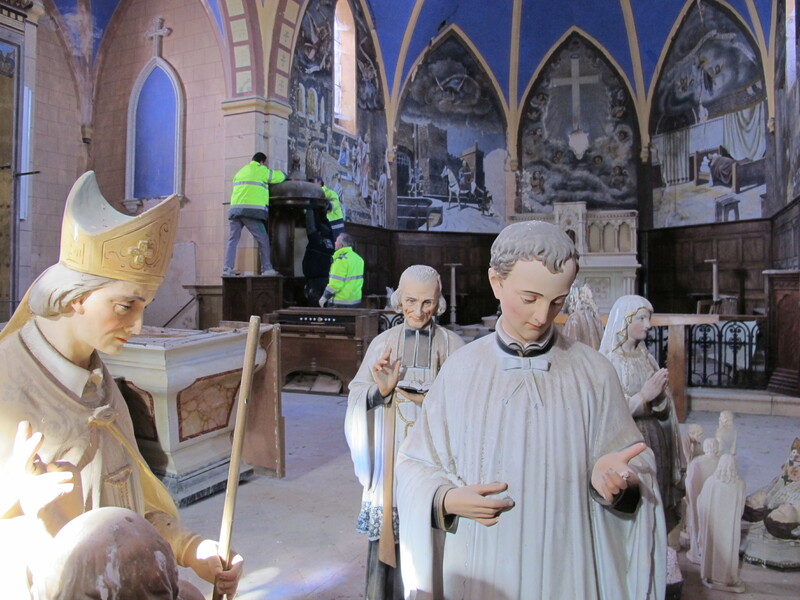 It seems that something will need to go into the church to have it preserved. Perhaps the suggestions can come from your group and some of the families who are associated with the church. I obviously don’t know what activity groups you have in your town i.e. artists who need studios, schools i.e. small elementary school etc. Present a proposal to the mayor/city council for a project that wil be good for the community (may need to get signatures for this from community residents) etc. Perhaps the town can pay for the project if it is in the best interest of the community. The other thought is to have a developer come in and make it into a house or apartments. Drawing attention to the problem in a community newspaper may help. I lived in a historic neighborhood in Baltimore for 19 years. The house I renovated was from the 1800’s. I got used to advocating for different projects in the community. One time I went door to door (me only) and got 300 signatures as part of my community to present to the city against a project in my neighborhood. The city went ahead with it’s project but we had made such a noise about the issue that I had members from the city council calling me to discuss the issue which was such a surprise to me. Any way sorry for going on and on about this. Best of luck. Good suggestions Ann! How about a letter campaign? I’m willing to write one if Robin can tell us where to send them. I bet if they knew the eyes of the world was on them, they would be careful what they do next. Proposal of the change of use to a Public Library …with the Complete Collection of Poldark in it would make it a Pilgrimage Site…?! Williness to invest public funds could be enhanced… To avoid the emminent peril at least the Downspouts should be redirected so that the rainwater will stop washing away and undermining the foundation of the corner stones…The wall is sliding down the slope…Bracing should be installed…Stucco should be repaired not allowing the humidity and water to enter the “Expansion joint”. Easy problems to be temporary corrected by local masons. Your admiring Commoner. Arch.Hedvika K.
Thank you, Hedvika–sounds like good advice from an expert. Last night I began watching my parents’ DVD of Poldark with my 11 year-old. I discovered the series with my parents, read the books, and really enjoyed the whole “Poldark” endeavor. I discovered the existence of this blog mentionned on the inside of the DVD cover and of course! looked it up. 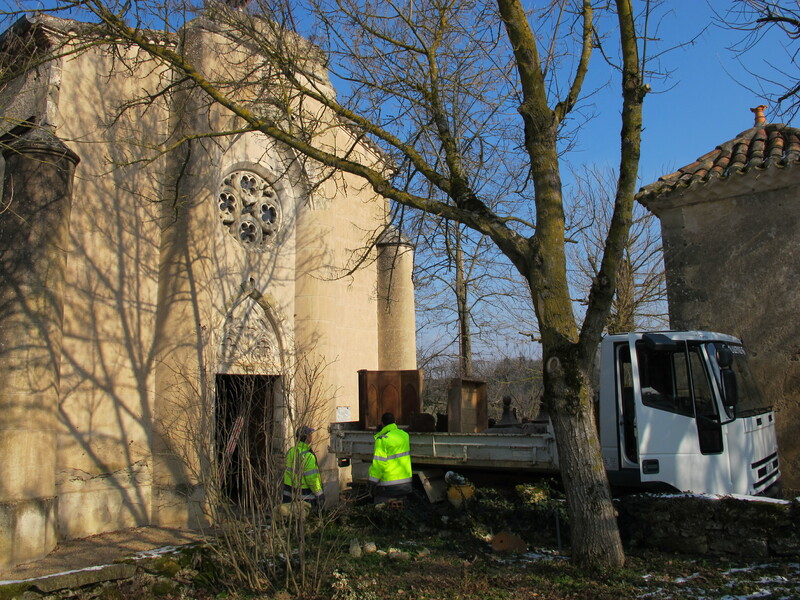 The whole situation of a crumbling village church hits home, I now live in France too,in the Mayenne, and the nearby church is falling to bits. Unlike yours however, the 18 seventy something construction has no architectural or historic merit whatsoever and it would be a relief to most of the villagois to see it torn down, as various and sundry pieces are constantly crashing to the ground and the whole thing is halfheartedly blocked off by tape to try to prevent anyone from being hit by one of the falling stones. For now nothing more is being done because there is no point in repairing it due to the poor quality of the original structure and building materials, nor does our Mayor want to try to demolish it due to both the cost and out of fear of attracting the attention of a protection de patrimoine group. So it is collapsing on its own. Good luck with your church though. Anyway I enjoyed looking at your blog and may just have to try out a couple of the recipes, my French husband would be delighted to be served something outside of my usual handful of recipes (“nous mangeons du pizza nous sommes Dimanche”).